Save up to 25% with our monthly subscription packages and never run out of your Vitamin Patch supply! Dubbed 'Patch Perfect' by Vogue, you can now sign up to one of our monthly subscription packages for huge savings and the convenience of knowing your vitamin patch supply won't run out anytime soon! 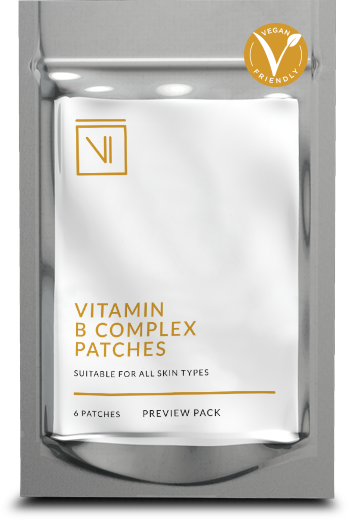 Our 12-month Vitamin Patch subscription package offers the best saving at £37.50 each month, that's £450 a year! Subscribe now and be worry-free! 1200mg Vitamin B12 (methylcobalamin), 400mg Folic Acid, Vitamin B1, Vitamin B3, Vitamin C and Vitamin E.
1000mcg Vitamin B12 (methylcobalamin), 400mcg Vitamin B1 (thiamin diphosphate), 200mcg Vitamin B2 (riboflavin 5’-phostate), 200mcg Vitamin B5 (pantethine), 100mcg Folic Acid, 50mcg Vitamin B3 (inositol hexanicotinate) and 50mcg Vitamin B6 (pyridoxal 5’-phosphate). 5000 IU Vitamin D3 (Cod liver oil extract), and 250mg Magnesium. We do not diagnose or treat any medical condition or disease. Our products are for health maintenance only. Nothing in the information provided is intended to treat or cure disease or to replace conventional medical approaches. First set will be sent out within 3-5 days of the subscription. Patches for next cycle will be sent out first week of every month until subscription ends.